I walked into the APA one morning after three months of sadness over the death of my 15 year old Wheaten Terrier. 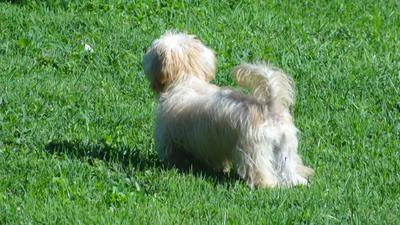 On the way to the Animal Protective Association, I asked my deceased Wheaten(Princess) to help me find the right dog. My new dog Scout was the third dog I saw there and it was instant recognition that he was the One. He was Whimsical, silly, intelligent and very friendly and much the same color as Princess. He was Much smaller and they had named him Teddy. As I left with him in my arms I heard over the PA system: "Teddy is leaving the building." He fetches, he herds birds, people and even the collie next door and he meditates with me and he curls up on my shoulder like a cat while I am in my Lazy-Boy watching TV. I got exactly the right dog. He is adorable!!! Lucky you! My Charlie loves to lay on the backs of chairs, sofa! Happy to hear you've found your new best friend. Much happiness to you and Scout! Scout is a very lucky little dog now. These little dogs give so much love. Best to you both. Join in and write your own page! It's easy to do. How? Simply click here to return to Coton Rescue Stories.